This MENA Country Is The Best Performing Emerging Market In Last Five Years, But Is The Magic Fading? Bear Alert: Can Taiwan Stocks Sustain The 10,000 Level This Time? Emerging Markets from Asia have been the best performers among regional markets over the past five years. That is why, three of the four markets in this review are from the continent; the third one being the Philippines. Philippines stocks are the only ones, apart from the UAE, India, and Taiwan, which meet our shortlisting criteria of 8% annualized returns over the past five years for this series. This is measured by the MSCI Philippines Index. 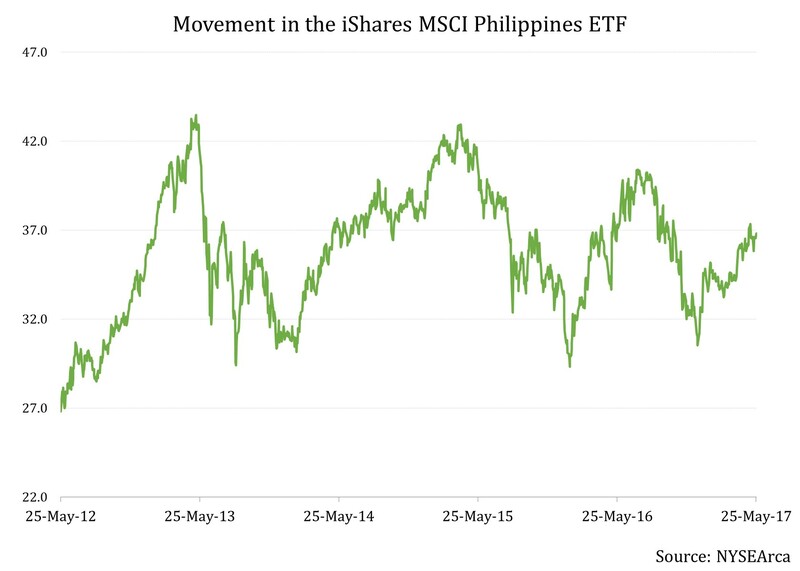 There is only one ETF available to US investors for investing in Philippine equities: the iShares MSCI Philippines ETF (EPHE). According to Bloomberg data, net inflows of $32 million have been seen in this $200 million ETF so far this year. 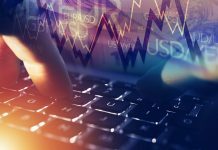 However, US investors have not been too keen on this ETF in the medium-term as the fund has witnessed net outflows amounting to $145 million over the past three years. Those investors which have braved the rocky stock market over the medium-term, have been rewarded for their patience by the industrials, real estate, and financials sectors. While SM Investments Corporation (SMIVY) and JG Summit Holdings, Inc. (JGSHF) have powered returns from industrials, SM Prime Holdings, Inc. and Ayala Land Inc. have done the same for the real estate sector. The latter three are the top three largest holdings of the EPHE and form a combined one-fourth of the fund’s assets. Rounding off the top five holdings are BDO Unibank, Inc. (BDOUY) and Ayala Corporation (AYALY), which have led gains from the financials sector. With its top six holdings, which form 46% of the portfolio, the EPHE has done quite well in the past five years. This performance has flowed into this year as well. 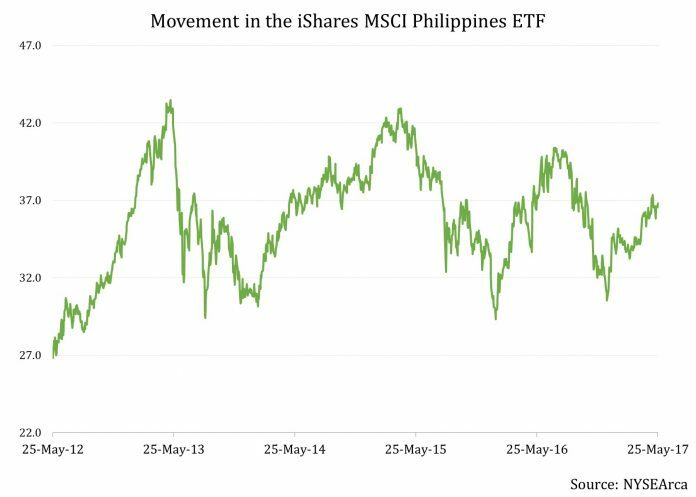 The MSCI Philippines Index has returned a remarkable 14.7% in YTD 2017. However, in Asia, which continues to lead the broader emerging markets equities, this performance places the Index only sixth among 10 that MSCI computes for the region. The macro picture of the country remains solid. Finance Undersecretary Gil Betran, chief economist of the Department of Finance, recently informed that the country’s economic growth stood at about 7% in the first quarter of this year. Inflation also remains under control. Further, the country’s stocks were able to seemingly shrug off the martial law declared for Mindanao. However, there is an area of caution: Philippines stocks are not cheap. 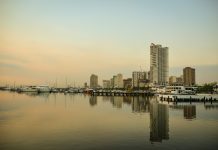 The EPHE has a price-to-earnings ratio of 20.32, making it one of the more expensive markets in Emerging Asia. 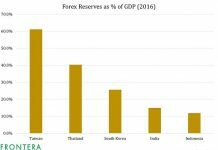 Due to this investors should be a bit cautious while initiating fresh buying positions in the country’s stocks. Previous articleBear Alert: Can Taiwan Stocks Sustain The 10,000 Level This Time? Next articleBack In Black: Do Better Economic Prospects Lie Behind The Brazil Central Bank’s Hawkishness?